Kites! Yes, kites. This stamp set is so wonderful. When I realized I could make cards with kites on them, I had to have this set. As I posted before, I was not interested in this set the first time I saw it or even the second. LOL. The swirls just didn't catch my attention. I noticed someone had made a project that used this set and it had a sailboat. That caused me to take another look. I am so glad I did. I sponged Soft Sky and Pear Pizzazz on a piece of Whisper White (4 x 5 1/4). 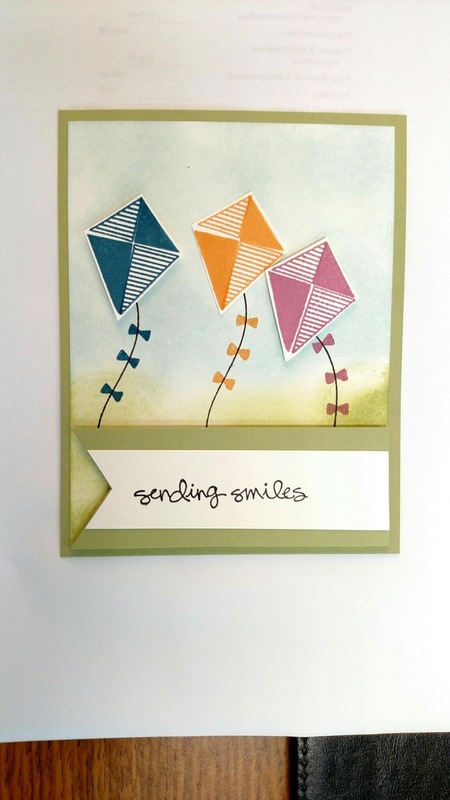 The kites are stamped in Dapper Denim, Sweet Sugarplum, and Peekaboo Peach and fussy cut. I used the Triple Banner punch so my banner pieces would line up. It is all attached to a 4 1/4 x 5 1/2 card base in Pear Pizzazz.